I love the Tampa Bay Nightlife! It doesnt really get any better than a Saturday evening enjoying the Tampa Bay nightlife scene. That is what Jerm did this past weekend, or at least the highlight of it. I kicked off my saturday night with a friend and a quick drink over at one of the Westshore Districts hotspots, Blue Martini. I hadnt&apos;t initially planned on doing much that evening, until a friend called me and asked me if I wanted to make a run to International Mall with her, and you know my rule of thumb...if a pretty girl asks you to do something, you had better get to it! She wanted to get a gift for her mother well in advance of next weekend with it being Momma&apos;s Day and all, After we walked around a bit and found a gift, I had gotten a little hungry and what better place than The Cheesecake Factory when you need a bite to eat. Started off the evening with more drinks in the form of Strawberry Martini&apos;s, which were rather tasty if I do say so. If you ever make it to the factory for dinner, then you have to start out with the Tex-Mex Egg Rolls. These bad boys are good enough to make you want to slap somone! After the rolls were done, my entree had arrived in the form of the "Madeira Chicken." This is quite possibly the best dish I have ever eaten anywhere gang! SOOOOOOOOOOOO good, it didnt take long for me to make a happy face on my plate. Another great thing about that place is the service, as our waiter was great and even managed to teach us some cool phrases in Italian...no, not the dirty ones, so get your mind out of the gutter. After that we really didnt want to go home, so we decided to check Fandango app on my IPhone and see what was playing at the movies. It had been a long time since we had been to the movies so it was a good time to check one out. After a lengthy discussion it was decided that we should go see Beyonce kick some tail in that new movie "Obession." The movie didnt start until about 10:25 pm so we needed some time to kill, and what better way to do so, then to head over to Splitesville in Channelside Bay Plaza and have another drink! 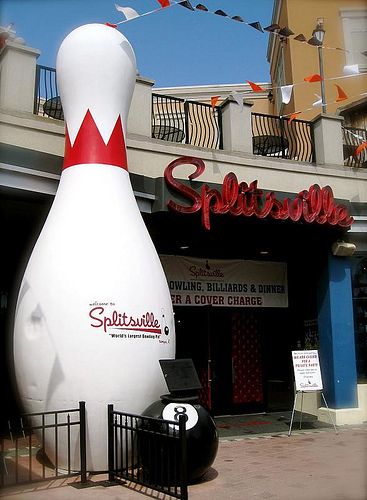 After that we hit the movies, and then decided to come back to Splitsville and chill out some more! All in all, it was a good night of shopping, food, clubbing, and movies. Can&apos;t get much more excitement than that gang, and its all here in Tampa Bay! Stay tuned for more Jerm weekend updates and be sure to tune in for more things to do in Tampa Bay!